Style Club salons are some of the funkiest unisex hair salons with the most cutting-edge salons in the country. Using the most up-to-date techniques, Style Club offers a contemporary approach to hair and style. we’ll help you create a truly individual look – unique to you and your personal style. Style Club is a hair salon. But Style Club is also NOT a hair salon – because it’s about much much more. So if you’re into style with a twist, there’s only one place to be and one thing to do – check out Style Club today at our 4 salons in Dublin 1, Dublin 2, Swords and Tallaght. How it Works: Use this gift voucher on AllGifts.ie to order gift cards for use in any Style Club salon in the Republic of Ireland. Or you can swap this voucher for any other gift or voucher listed on AllGifts.ie. Style Club gift cards are posted out free of charge once ordered. 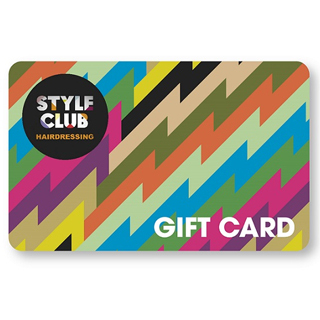 Style Club gift cards are available in denominations of €25s, €50s and €100 (e.g. €25, €50, €75, €100, €150, €250 etc). Minimum gift card value is €25. Style Club offers a contemporary approach to hair and style. Using the most up-to-date techniques, we’ll help you create a truly individual look – unique to you and your personal style. Style Club Gift Cards are posted out free of charge, normally within 5 working days.